On April 6, 2019, JMT Architecture attended the Towson Chamber of Commerce Toast of the Town event, where the firm was recognized as a 2019 “Build” honoree. The lively dinner event was held at Stanley Black & Decker Global Headquarters in Towson and included 150 guests representing the local Towson community and other honorees. Architects Albert Rubeling, Jr., FAIA; John DiMenna, AIA; Dave Recchia, AIA; Mitch Nelson, AIA, CSI, CCS, CCCA; and Landscape Architect Mark Shrift, RLA, represented JMT at the event. Their spouses also were in attendance. To the “Build” Honoree recognition, Rubeling commented, “It has been an honor to enhance the quality of life in our hometown and county seat, starting in 1981.” JMT Architecture, since its founding as Rubeling & Associates, has maintained a strong presence in Towson. The firm has been devoted to the local community, connected through volunteering, leadership, and notable design projects. The firm has completed almost two dozen public and private projects over the last 25+ years. DiMenna, specifically, has been an important figure in the area, connecting the firm to Towson through his leadership as a former president of the Greater Towson Committee and the Baltimore County Design Review Panel, of which he has currently serves as the Panel Chair. Money raised at the Toast of the Town benefits the Towson Chamber of Commerce’s mission to promote the business community in Towson, as well as supports various beautification projects around town. In its second year, the event serves as an opportunity to recognize community leaders, projects, and businesses while supporting future works of the Chamber. 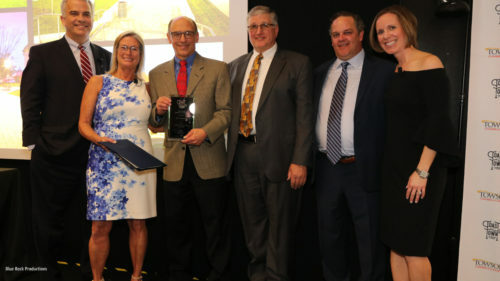 The 2019 “Build” Honoree included an additional recognition by the Baltimore County Council in the form of an official Resolution, which states that, “This honor is bestowed upon a successful business that has surpassed the needs and expectations of the community and whose untiring commitment, dedication and generous contributions have promoted economic viability to the area.” JMT Architecture was also recognized with a Baltimore County Executive Citation, as well as an Official Citation from Delegate Stephen W. Lafferty.